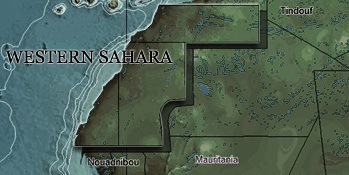 A group of three Norwegian shipping companies have stated that they desist from future assignments in Western Sahara. Illustration photo above shows bagged fishmeal being loaded at the El Aaiun harbour, November 2008. The vessels are not related to the 3 companies mentioned in this article. The Norwegian Support Committee for Western Sahara discovered recently that the Norwegian owned vessel 'Kine' had visited Western Sahara. The vessel transported 2227 tonnes of bagged fishmeal from the occupied territory. The ship is owned and managed by the Norwegian companies Vaagebulk IV, Vaage Shipmanagement AS and Wagle Chartering. The three shipping companies told the Norwegian Support Committee for Western Sahara that they were not aware of the fact that the shipment had been done at all. Such shipments are in violations of the recommendations of the Norwegian Ministry of Foreign Affairs. According to information that the three companies have provided to the Support Committe, 'Kine' arrived El Aaiun harbour in Western Sahara on 7 August, and started loading the fishmeal the following day. On 11 August, the ship had loaded the 2227 tonnes, which were to be transported to the importer Elagro SIA in Latvia. Download the cargo documents here. The fishmeal was produced by the Moroccan company KB Fish. "We do not want our vessels to be used in Western Sahara", confirmed Mr. Biørn Borge, CEO of Wagle Chartering, on behalf of his company and of the companies Vaagebulk IV and Vaage Shipmanagement AS. At the time the vessel carried out its transport, she was chartered by the Dutch firm Hudig & Veder. Mr. Borge said they will convey their position to the Dutch company. They furthermore state that they will state their position on Western Sahara trade once they chart out their vessels to other companies in the future. Last week, the Norwegian shipping company Atlantic RTI / Fearnley Finans said that they too want to avoid such trade in the future, by introducing a Western Sahara ban in its future contracts.